Henry’s sister married Tom Arrowood at a young age. Brice described Aunt Maggie as “a meek woman, and she was not healthy,” maybe her heart. “She married a man kinda like her father, a no-nonsense man, stubborn as an ox. Granddaddy helped them build a house across the hill, right above the old mill near where he and Granny lived.” Maggie and Tom had five children. Being good doesn’t help when it comes time to bury the young. Miz Nor had to bury her daughter in 1929 in the Macedonia Church cemetery, and three years later, Maggie’s son John Wilson Arrowood was buried close to her. He was thirteen. Together this couple had seen an amazing change in this country. From the isolation of a home in the wilderness to crowds of people in the gold era back to a small group of survivors from all genres. From wagons and mules to automobiles. From oral history shared on front porches to the magic of the telephone. From fighting among brothers to a united front against other countries that threatened hometown freedoms. Their generation had the wisdom to adapt gracefully to new circumstances without losing core values. There was a global battle for individual freedom that would always begin with good relationships among neighbors. There was still a large family around to share the daily load. In 1943, Miz Nor was laid to rest next to JJ near their cabin. The people of the community hovered around, and at the end of the service, they sang “Swing Low Sweet Chariot,” honoring the strong woman who had taught many of them to sew. When Henry’s children were young, the women had cooked for the grandparents and the younger ones. “They were like part of the family,” said Nora. It was a different time and place where individual contributions were treated with respect and not lumped together in a demeaning category. When people stood together against a common foe of starvation and appreciated a helping hand, there was only one team. Somewhere we have forgotten the blessings of working together as communities. Divided we fall. 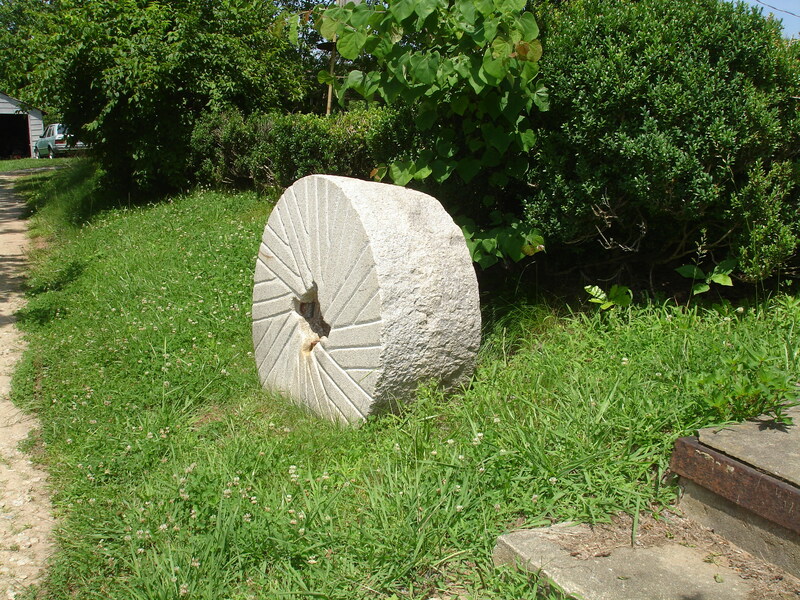 This entry was posted in Brackett Town Saga, Characters and tagged Grist Mill Wheel, JJ Sprouse. Bookmark the permalink. The last two sentences in your blog are so true. Let’s hope and strive to turn it around in our generation. Nora, I find that I can get along with most individuals I communicate with directly, but not if I typecast them into groups described by those with agendas. Politics confuses me. Neighbors I understand. Hi Georgia Ruth, My maiden name is Brackett and through genealogy, we found Brackett Town. Our whole family loves reading your blogs. Thank you. Welcome, Mary. I hope you will share your ties with this special place.